I have considered this a bit of a pest until this year, not really going so far as to uproot it on purpose when it's in the background but definitely mowing it down if it's in a mowing area. I looked it up and gave it a bit more 'time' this year, the point is it looks good and flowers in August/ September when there might not always be too much going on. Have you got it? Definitely doesn't need much in the way of care/ attention/ watering - always a plus in the garden. Re: Golden rod - nice to have or a liability? A weed is only a plant growing where it is not wanted ! 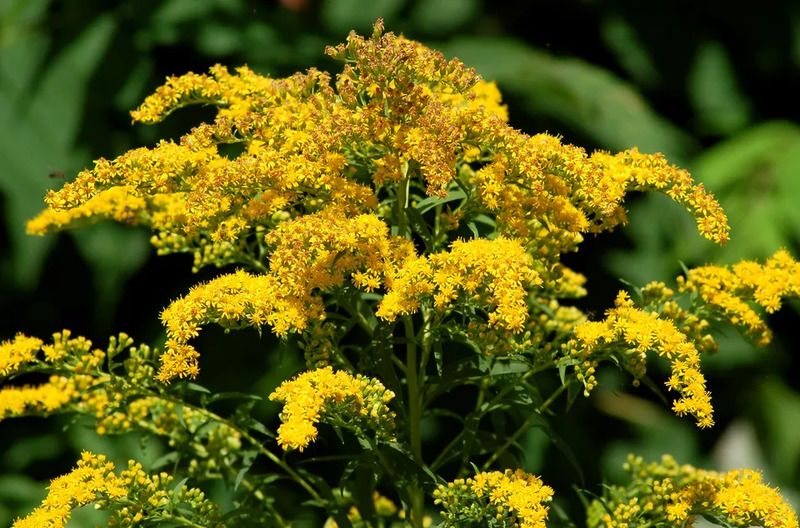 Goldenrod can be invasive so care has to be taken with its location. I would only have it in a corner but then I would expect neighbours to complain about it spreading under the fence. Luckily I have neither neighbours nor goldenrod !! Bee keepers like it (on someone elses land) because it can produce a good quantity of nectar. Well it's not exactly Japanese knotweed nor even as energetic as dandelions/ bindweed/ nettles etc. Just gradually seeds itself and if you pull it up, it goes away. I think it it was not labelled as invasive, we'd all be buying it down the garden centre. There are lots of types of goldenrod, some more invasive than others. Apart from (self) seeding they also spread by rhizome growth - and it's this habit that makes them invasive. Well you haven't got it, whilst I have! I can report that compared to nettles, dandelions, bindweed, lots of other weeds, it's a complete walkover. Just pops up in a few corners and looks fantastic yellow in August. In fact, you'd probably pay to get that so-called weed to put in an appearance in your garden. We've had it several years now and it's not really invasive: I think I could just pull it all out next spring and it would be gone. Yes, it's moved around a bit, but doesn't tolerate getting mowed. Plenty of other self-seeding plants that are just as likely to colonise your garden, many of them desirable such as poppies. Cannot remember the exact details but Golden Rod is considered invasive and the authorities are always trying to remove it from National Parks. There was a lot of articles on this about 4/5 years agobut I cannot remember where. Could try the National Parks website and see if they have articles on it.